Content marketing can create fantastic success stories for those who use it correctly — make sure you’re getting your content right and maximising your ROI. Content marketing has blazed a path through the marketing world in the past few years, offering great ROI for those who fully understand the process. There is, however, a serious problem. 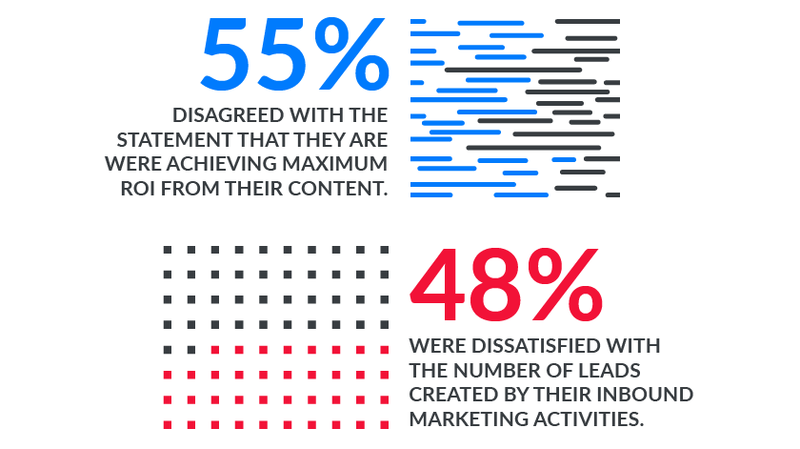 According to Tomorrow People’s ‘How good are you at content marketing?’ survey: But is content marketing really to blame or is there something else at play here? We’d argue that it’s the latter. The main issue? Too many companies are operating in the dark – they understand the basic principles of inbound marketing and they are creating content. But... According to Tomorrow People’s survey, the answer is an unequivocal “no.” Worse still, some companies think they are creating great content, when judging from the lack of ROI generated, they clearly aren’t. Tomorrow People and B2B Marketing’s research reveals that 51% of marketers do not have the correct content in place for each stage of the funnel. It’s clear that pragmatic directions are needed to help those struggling to navigate the roadblocks on their inbound marketing journey. Welcome to our content roadmap. Top of the Funnel — “Awareness Content"
The potential buyer begins to put out ‘feelers’ about how to solve their particular business pain, looking for initial materials to help give them a helicopter view of the issue. Your content at this stage needs to offer them informative, entertaining and educational materials that don’t push your product or service – the goal is to help them in their research, not hawk your goods. Use this stage to build trust and encourage them to opt-in to the next part of your funnel. White papers, eGuides, webinars, podcasts, videos. The key here is to offer bite-sized vendor-neutral content that is interesting, sticky and engaging. Keep themes strong and ensure the content offers visitors expertly-written but brief guides. Also ensure the content is practical and pragmatic in nature, so the visitor will actually learn something from it - rather than be drowned under a tsunami of marketing spiel. More visual-based content is ideal too – we process visuals quicker than text. Remember, snare the visitor's interest with stories that offer answers and encourage potential leads to opt-in to your content plan. Middle of the Funnel — “Consideration Content"
Once they’ve opted-in, focus on drip feeding content to your leads over a period of time. This content should be more in-depth and within a context you set. The intention? To get the leads to proverbially raise a hand, indicating that they are ready to move on to the bottom of the funnel i.e. they want to talk to a sales person. This is where you must let your expertise shine through; the customer has shown that they are interested in what you have to say so you can now push long-form content, increasing word counts and density of information. Bear in mind that while they want deeper information, presentation is still vital – dense, endless clumps of text risks them switching off – so use pullout stats, quotes, interviews and key data to keep the content sticky. Repurpose your content to drive down creation costs. The content required to service your funnel might sound like a time and budget intensive amount of work to create – but bear in mind you can repurpose your existing content. The data featured in a white paper could be used in a infographic; the overall findings of an eGuide repurposed into a quick 500-word blog. Bottom of the Funnel — “Decision Content"
Your content has done its job and the customer is now ready to make a decision. This is the critical stage – they need the final reassurance that you are the right fit for their needs. They want to feel confident that you offer the right solution to their pain, plus, you’ve given them the factual evidence required to win over the other people involved in the buying process. Case studies, testimonials, free demos, trial downloads (where applicable), product literature, product comparison materials. This is the nuts and bolts of your inbound marketing operation – what your existing customers have to say about how you helped them. Authenticity and clear presentation are vital here. For testimonials, feature genuine customers with their quote covering how your company solved their business pain, their picture and if possible, a link to their site. Case studies are also a vital tool – these should be simple and direct with the benefits of your services clearly stated. Your customer’s journey starting with the business pain, the successful outcome and what occurred after, ought to be clearly illustrated. Once you’ve landed the customer, your relationship with them really begins. Keep drip feeding them content that you know will resonate with them, offering them news and views on themes that will engage them. You should also provide details on other products and services that could complement their needs. Finally, identify who else they interact with in the workplace or what other third party suppliers they do business with - this data analysis can offer potential cross-selling opportunities. While the advice featured here will aid you in creating a more coherent content strategy for your funnel, only you know your customers. You know their pains, their personas and their idiosyncratic nature better than anyone. It’s essential that you test your content on a small scale with select client groups to see how it engages with them before going big. Using the resulting data and your inherent understanding of your market, you will be able to pull together truly world-class, high-performing content. Rate the characteristics of your content marketing strategy now by taking our content capability audit.